It’s fall and fall means pumpkin season! Pumpkins and squash are my favorite to cook- they have great flavor and are easy to prepare. This yummy recipe is super easy and a healthy alternative to the classic potato gratin (which I also love)! I got this recipe from the Tante Marie’s Cooking School in San Francisco. Their monthly news letters always have great seasonally inspired recipes. Enjoy! 3 lb. sugar pumpkin or butternut squash, peeled, seeded, and cut into 1-inch wedges. Pre-heat oven to 400. To cook the sugar pumpkin, place it on a baking sheet, coat with olive oil, and sprinkle with salt. 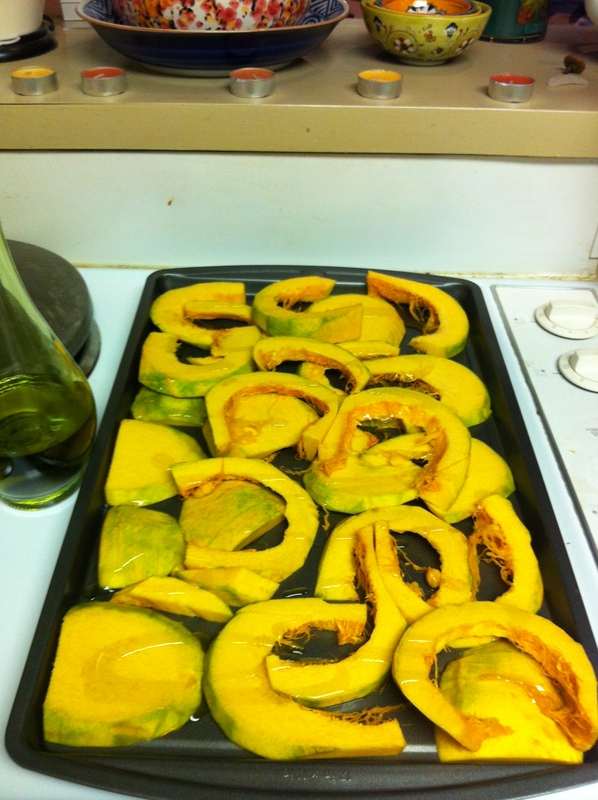 Roast in a 400 degree oven, until the squash is tender when pierced with a fork (about 20-30 minutes). Turn half way through the cooking, so that it browns slightly on both sides. (I used sugar pumpkin when I made this but I would recommend using butternut squash instead). 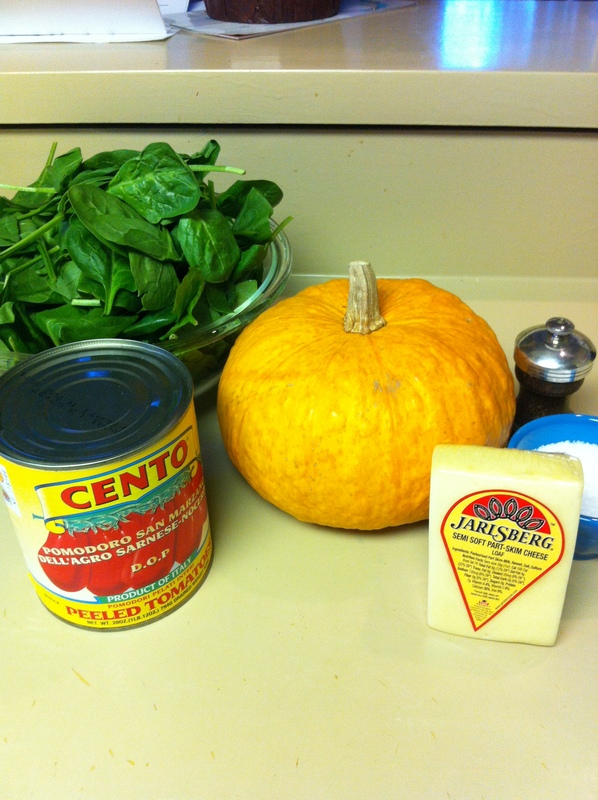 While the pumpkin or squash is baking in the oven wilt the spinach. In a large pot, bring salted water to a boil. Drop hand full of spinach into boiling water until wilted. Remove spinach from water with tongs and place on baking sheet lined with paper towels until all the spinach is cooked. 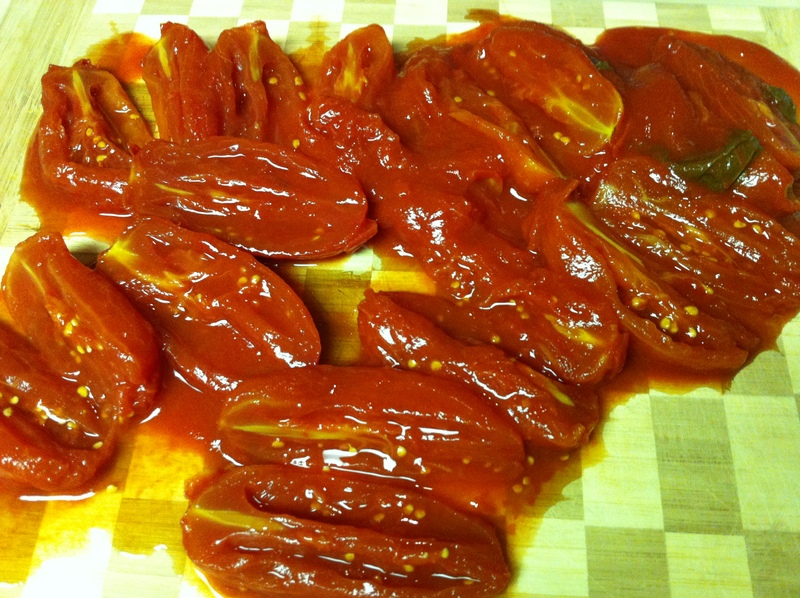 Next, cut tomatoes in half and set a side the juices. I used San Marino tomatoes since the fresh ones in the store didn’t look amazing. Grate cheese on large holes of box grater. I used Jarlsberg cheese, I prefer its flavor. To assemble, line a Pyrex or ceramic baking dish (about 14 by 10 inches) with a layer of squash, cover with the spinach, then the tomatoes, cut side up. Sprinkle with the grated cheese. 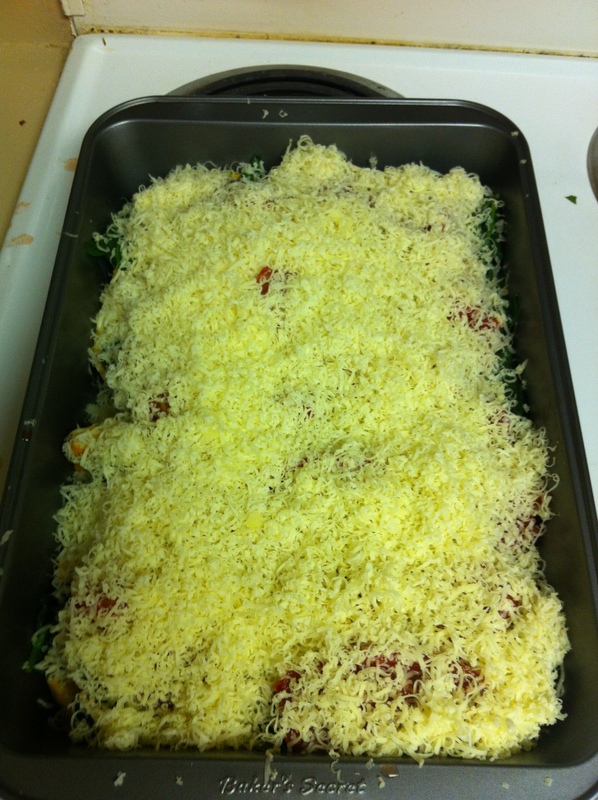 Bake in 350 oven, until the tomatoes and cheese have melted, about 30 minutes. Serves 8. This dish is great served with chicken, fish or enjoyed on its own. 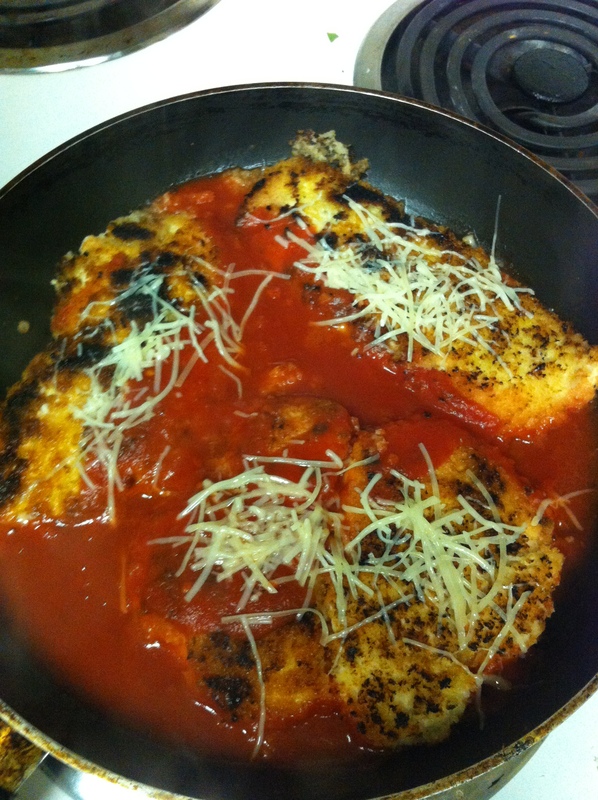 I used the leftover juices from the tomatoes to make my own version of chicken Parmesan. For the Chicken I took 4 chicken breasts and dipped them in 1 egg (whisked). I dredged them in Panko Bread crumbs and placed them in a skillet coated with olive oil on high heat. Let the chicken breast cook about 4-5 minutes on one side before flipping and turning down the heat to medium-low and covering. Let chicken cook for another 10 minutes on low before pouring remaining tomato juices and topping with grated Parmesan cheese. Cover and turn the off heat. Let chicken marinate for a couple of minutes covered on the stove. Serve with Pumpkin Gratin and Enjoy! 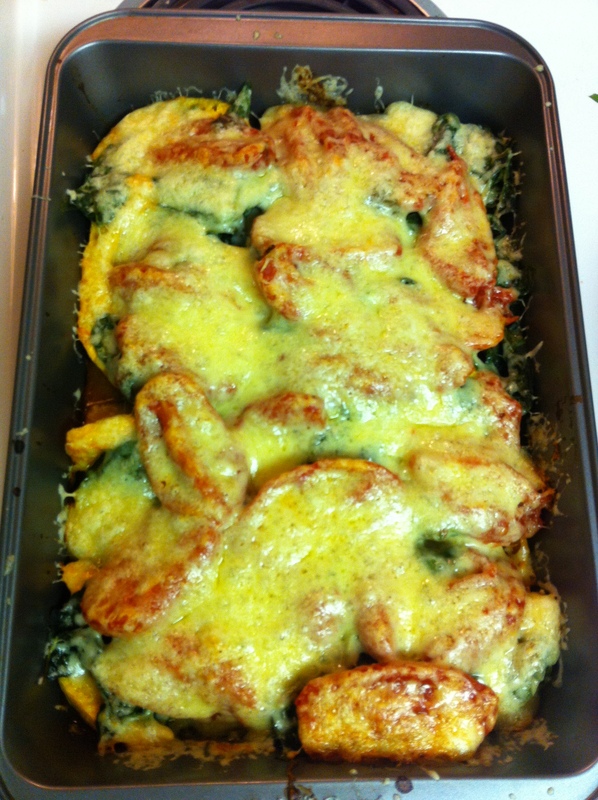 This entry was posted in Recipes, Sides and tagged Cheese, Gratin, Pumpkin, Spinach, Tomato by skibootsinthekitchen. Bookmark the permalink.